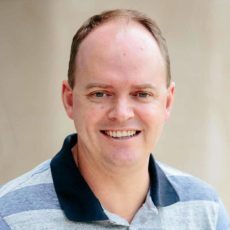 Dr Craig Bell works in A/Professor Kristofer Thurecht‘s group. Originally from Brisbane, he is currently on a NHMRC CJ Martin Biomedical Fellowship which has enabled him to work in the UK with Professor Andrew Dove and Professor Rachel O’Reilly at the University of Warwick (2014-2016). Now returning to work with A/Professor Kris Thurecht (2017-2018). His research focus is on the development of degradable polymer devices for imaging and tracking of disease and cellular processes by using a tool-kit of controlled polymerisation techniques along with polymer and molecular coupling methodologies. The incorporation of degradable moieties into these constructs not only allows for enzymatic and hydrolytic degradation for complete body clearance of these constructs but also allows for tracking of these devices in vivo upon degradation to help elucidate cellular processes.